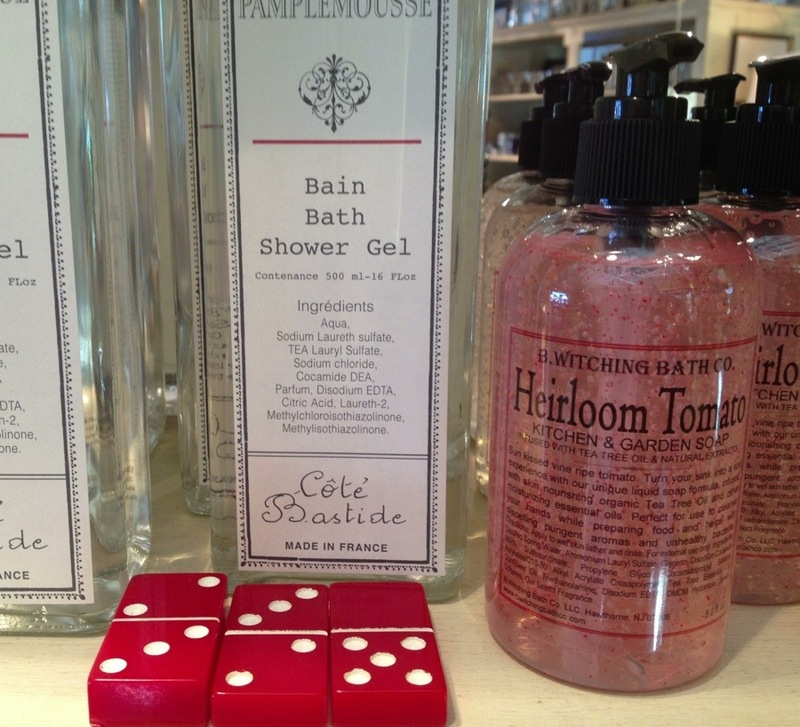 A spin around the shop floor had me noticing some things that I thought would be fun to feature today. 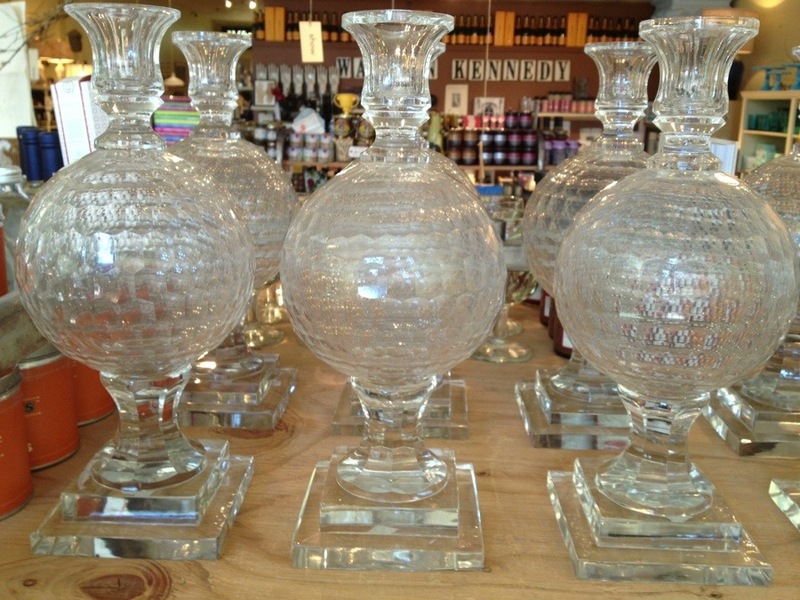 The above honeycomb orb candlesticks are just plain gorgeous. Whether singly or grouped together. They are also quite heavy. B.R. Cohn makes just the best stuff. This makes me think of Summer. 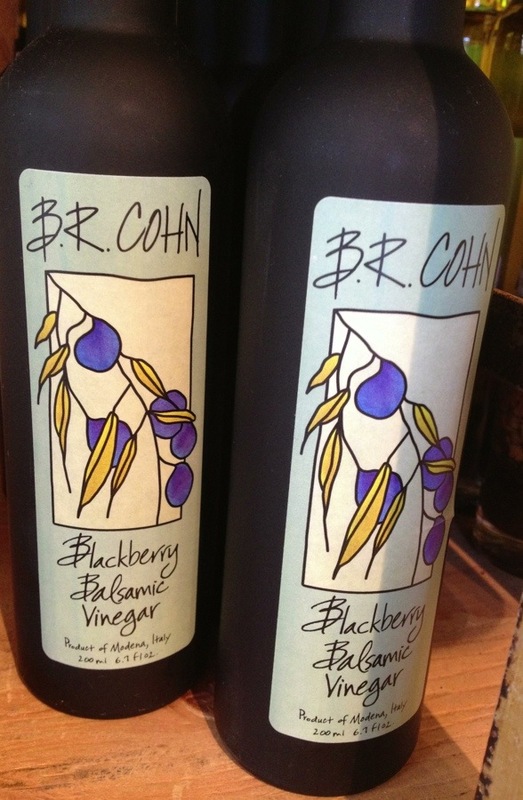 The drawing on the bottle reminds me of Chez Panisse. 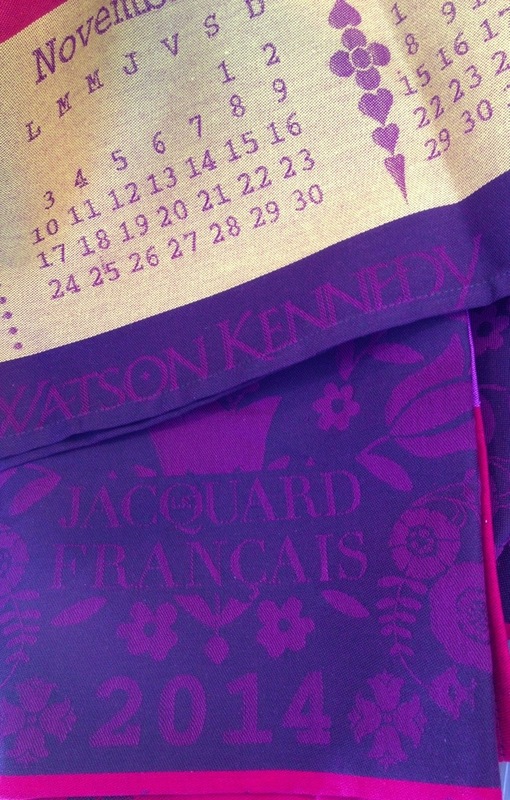 Our new 2014 Watson Kennedy calendar towel that Le Jacquard Francais makes for us each year arrived when we were in New York a few weeks ago. Boxes and boxes of them. I love how some customers have started a collection and have one from each year since we began having these made. 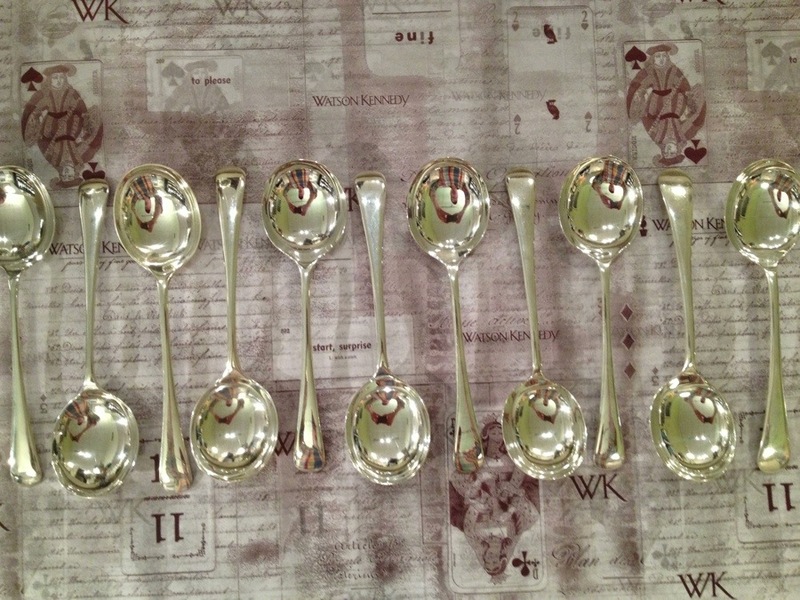 Lovely to use in place of wrapping paper and wrap around a bottle of wine or bubbly for a host/hostess gift. Have been really enjoying the color red this past week. Interesting how your eye gravitates to certain colors at times. Mine is going to red at the moment. 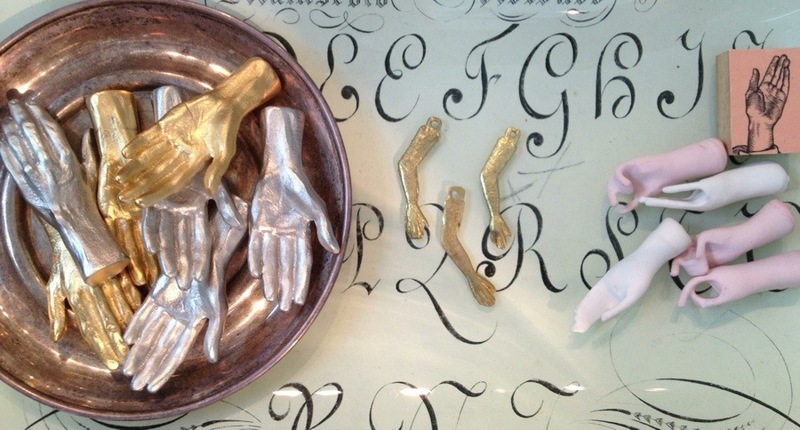 Always loving anything to do with hands. Always. Hands tell so much about a person. 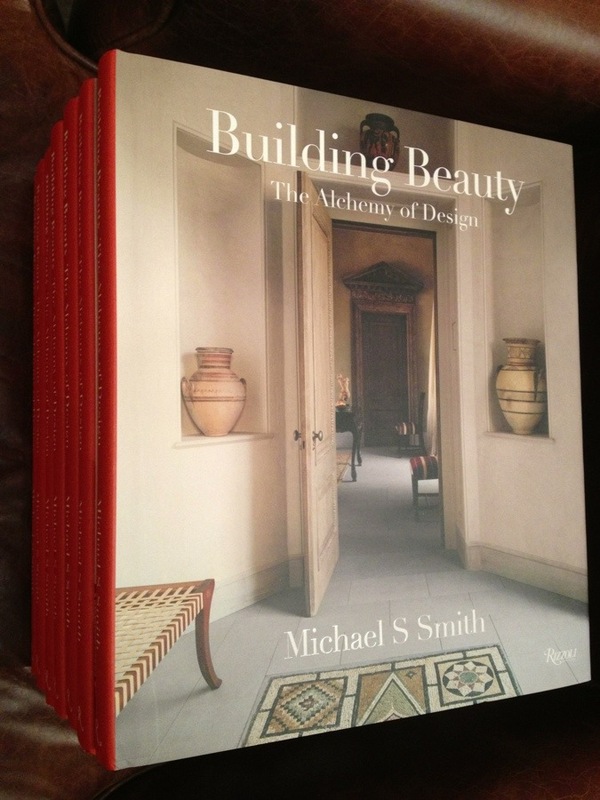 Just a pretty, pretty book by designer Michael S. Smith. Actually handsome is a better description. His work always a nod to earthy colors and strong architectural influences. 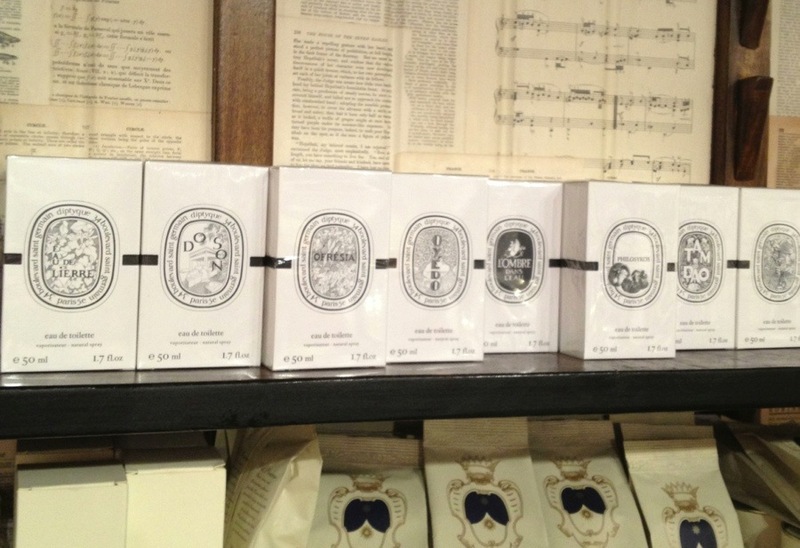 Diptyque re-packaged their edt’s in a new beautifully shaped bottle. Our order arrived the other day and I love seeing all of the new boxes lined up ever so neatly together. Visually I like seeing many of one type of item together. 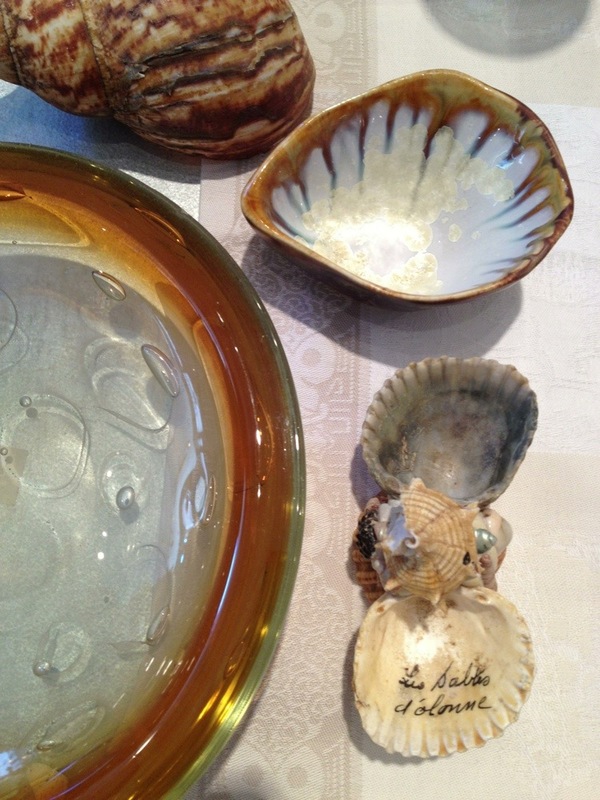 Murano glass and shells, oh my. 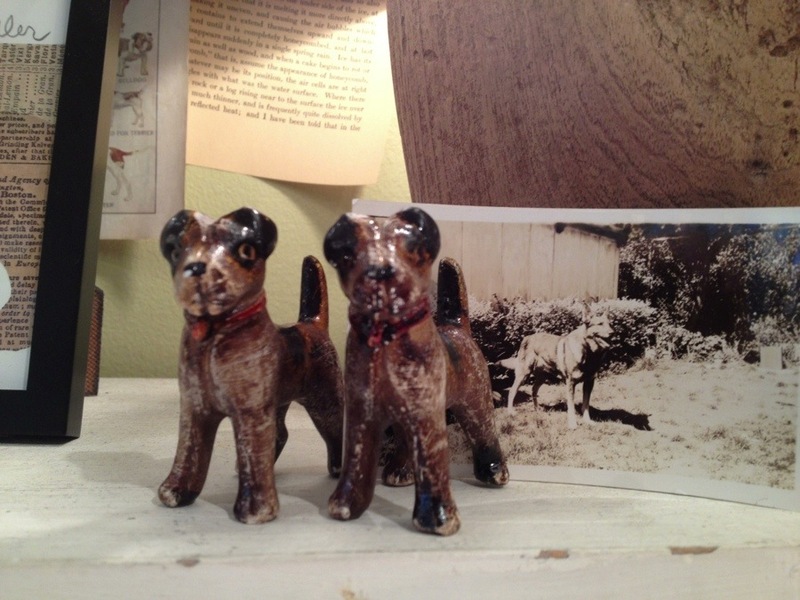 Just the sweetest little dog figures to have on a shelf or desk. Spunky little fellows. Yes, I am on a fresh herb kick. The plentiful-ness of the season just makes me want to use them as often as I can. We had several packages of goat cheese that had accumulated in our fridge in town. When I was packing up to head to the island for the week-end I threw one into the L.L. Bean bag, thinking I would find a use for it. The herb pots are going absolutely crazy with all this sun. A little herbed chèvre it would be. This is really the easiest darn thing to do, and it works well to serve on a cheese board too. For the other day, I stuffed the herbed cheese under chicken breasts, as TPS had made a special request for this for dinner, before roasting them. Within minutes, the house was filled with herby goodness. 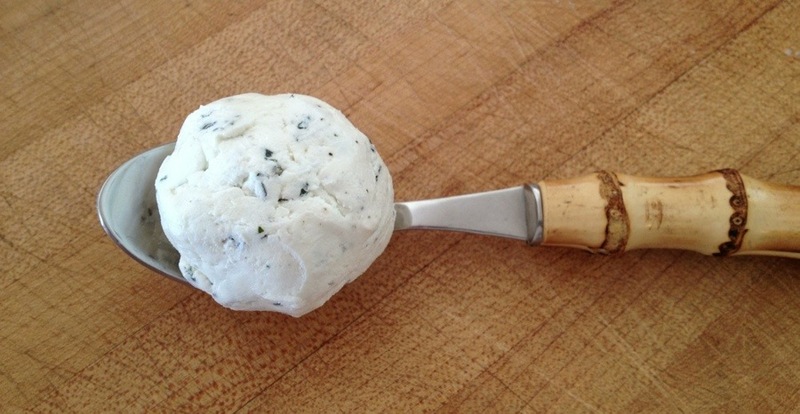 Let your package of chèvre sit out for a bit to soften while sitting in a bowl. Choose whatever herbs you like, such as oregano and thyme. Take off all the leaves from the stems. On a cutting board chop the heck out of those herbs until they are super fine. 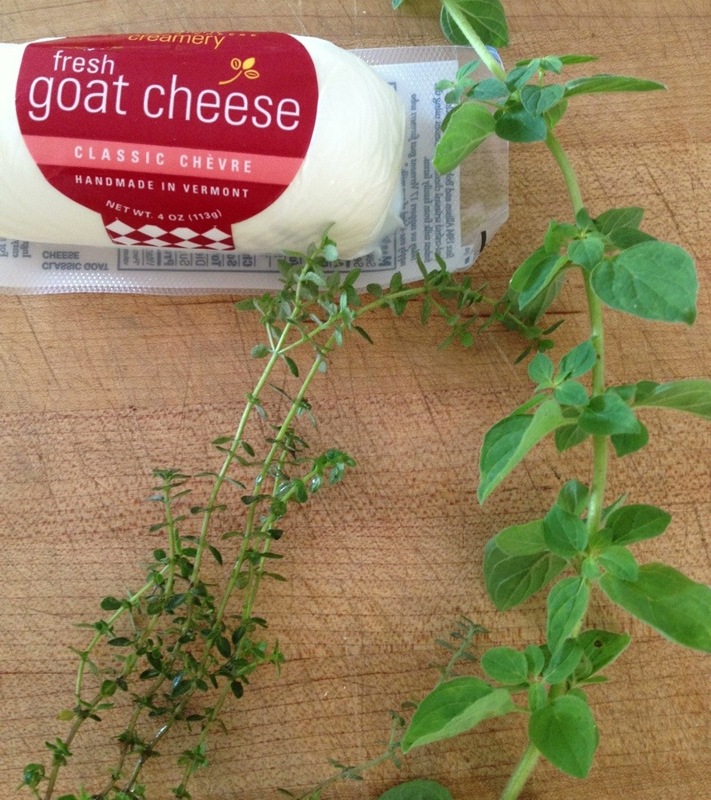 The oils will get released from the leaves and the tiny bits of herbs will be lovely throughout the chèvre. Add that to the bowl as well as a few good grinds of course pepper and a few pinches of salt. Mix together. Form into a ball or log, depending on what you want to use it for. That simple. But so, so yummy. As I tap this post out on my iPhone as I always do each morning, I am reminded at what a visionary Steve Jobs was. This little device that allows me, and so many of us, to do things and connect us to others around the globe with tremendous ease. His words perfect as we head into the week. A little fire in the belly and a little childish wonder is always a good thing. I had chosen a photo before I went to bed I had taken on the ferry of the water, but when I woke up it did not speak to me. 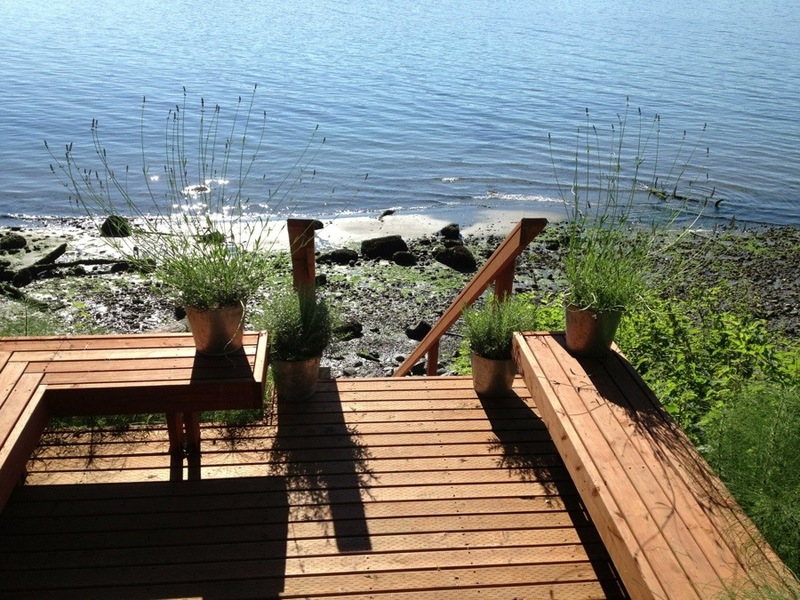 So a little Colvos Passage shot of our stairs down to the beach it will be. Not sure it completely relates to the quote, but I thought the lavender and rosemary in the buckets and the water would make an energetic shot. Happy Monday all! 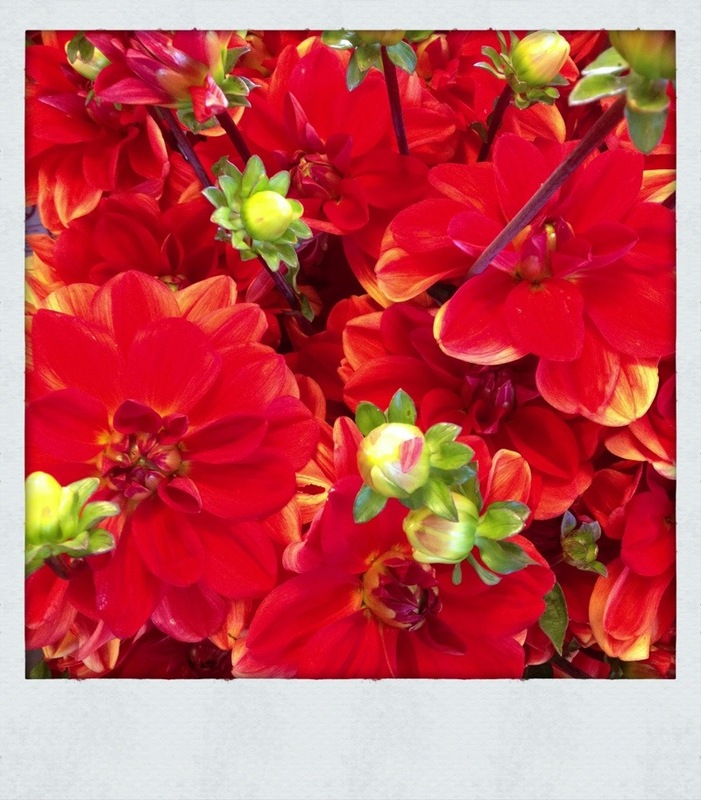 There is just something about red dahlias this season that keep catching my eye. 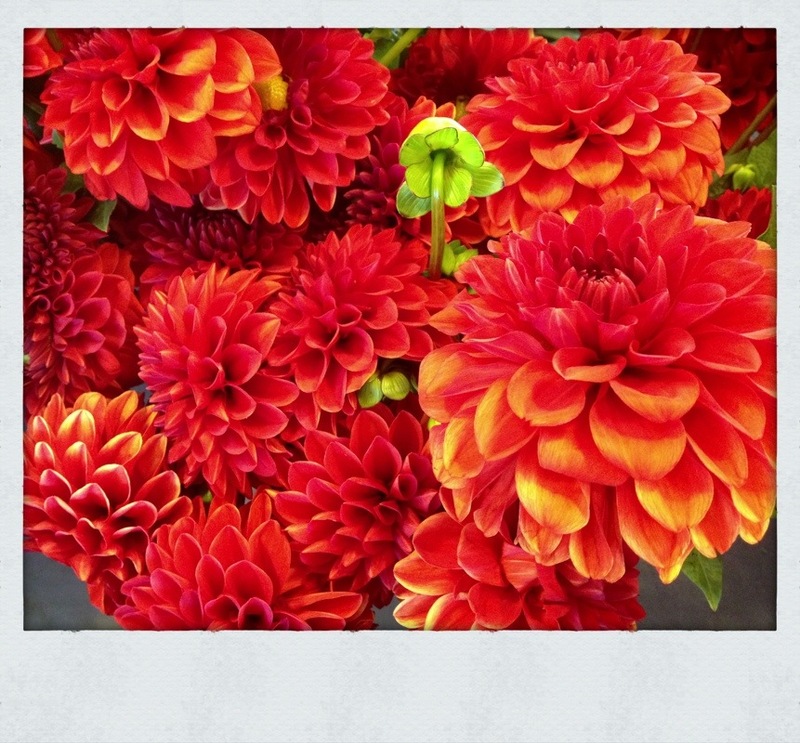 Each Saturday morning walk through the Market these past few weeks has had me stopping and clicking away at the red dahlias. The deep vibrant hue made even more lovely by the bits of yellow running through them. The variety of reds is also quite something. The energetic color looking so great massed together, it will make any tabletop they grace quite grand. No matter how you say it, saying it often is always a good thing. In our rushed world, it is the simple things that can get overlooked. But it is also the simplest of things that can have the biggest impact. 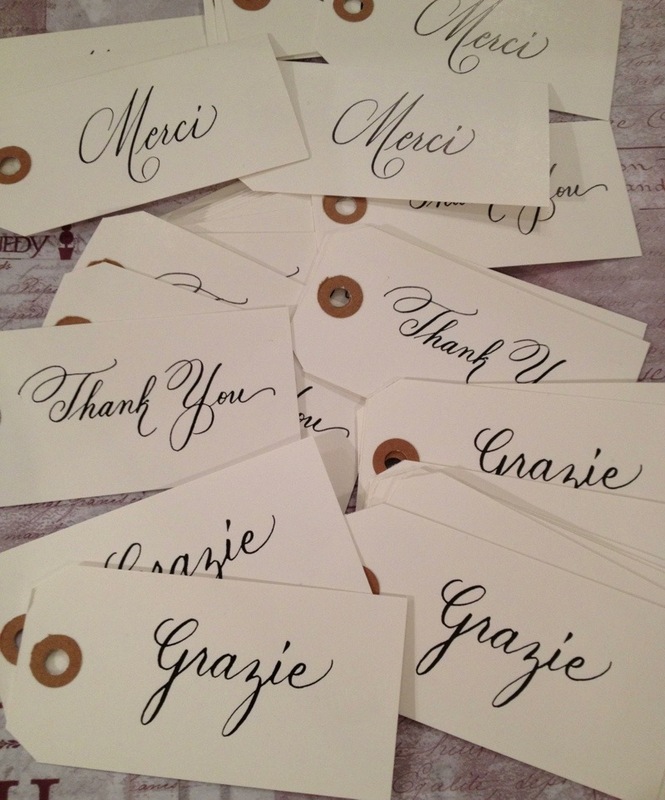 Giving thanks & saying it daily will brighten the day considerably to those you say it to. Happy Saturday all and “Thank You” always for reading. With herbs growing like weeds this time of year, and I do mean good weeds, I try and use them in varying ways. We had a guest last night for dinner. It has been a crazy busy week since our return from New York. 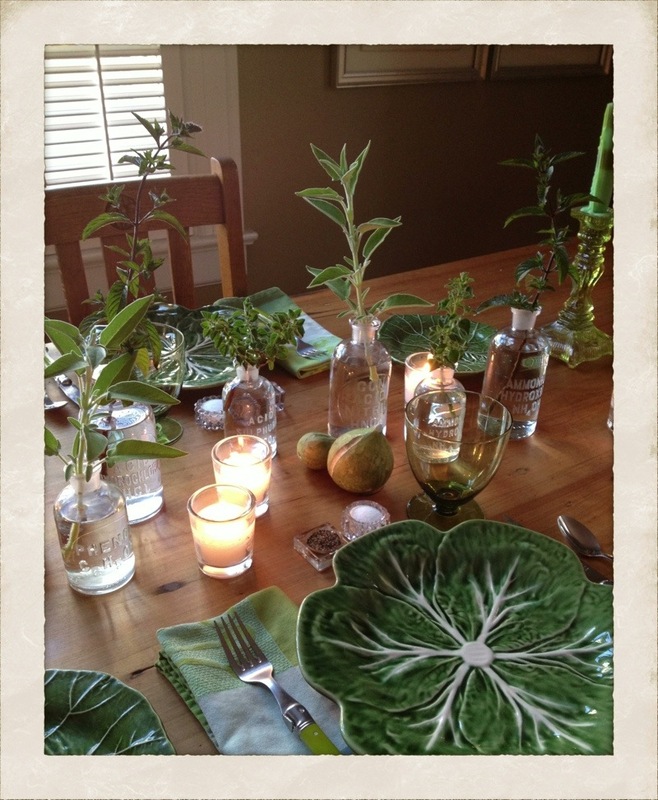 I really wanted to set an inviting table, but had not a moment extra to pick up flowers. A few snips of the scissors on the rooftop garden with all the herbs in pots was all we needed to add a little life & green to the table. 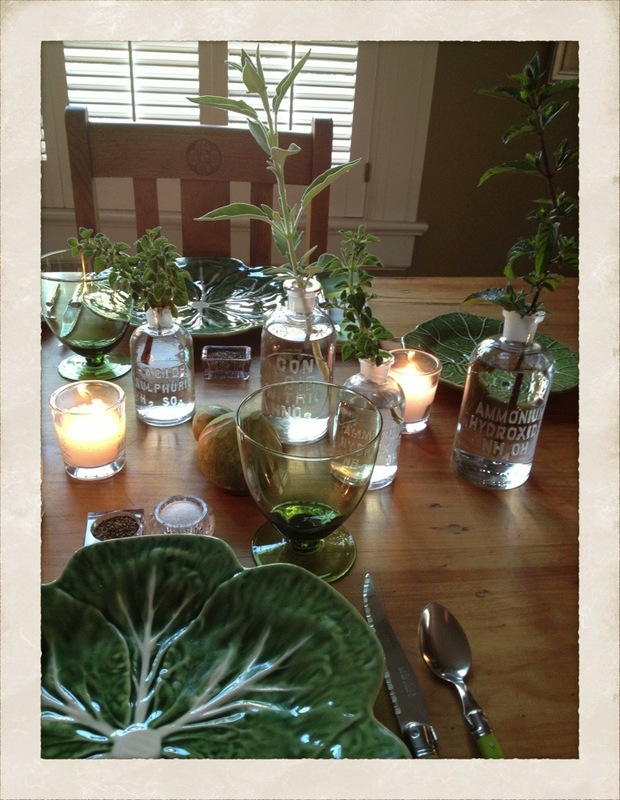 Mint, rosemary, oregano, basil, tarragon–really any herb that looks hearty will do. Add them to simple vases or drinking glasses. We have a collection of vintage apothecary bottles that work swell for this as the opening at the neck is small, so a single stem works perfectly. I scattered them down the center of the dining table, interspersing them with clear glass votive candles. All set for an easy weeknight meal. Over the years, I have really come to enjoy Sauvignon Blanc. I think it pairs beautifully with a host of foods, as well as just having it by the glass, solo. This leads me to this tasty bottle by Tyler Florence, Food Network host, chef, restauranteur, cook book author, and now wine guy. He is putting together a fab grouping of wine, with the Sauvignon Blanc being the white offering. We have had this with oysters as well as a roasted chicken, and the citrusy characteristics shined through–think Meyer lemon, orange blossom and grapefruit. Together with Rob Mondavi, Jr. of the famed Mondavi wine family, they have crafted a lovely, lovely bottle of wine out of the Napa Valley. 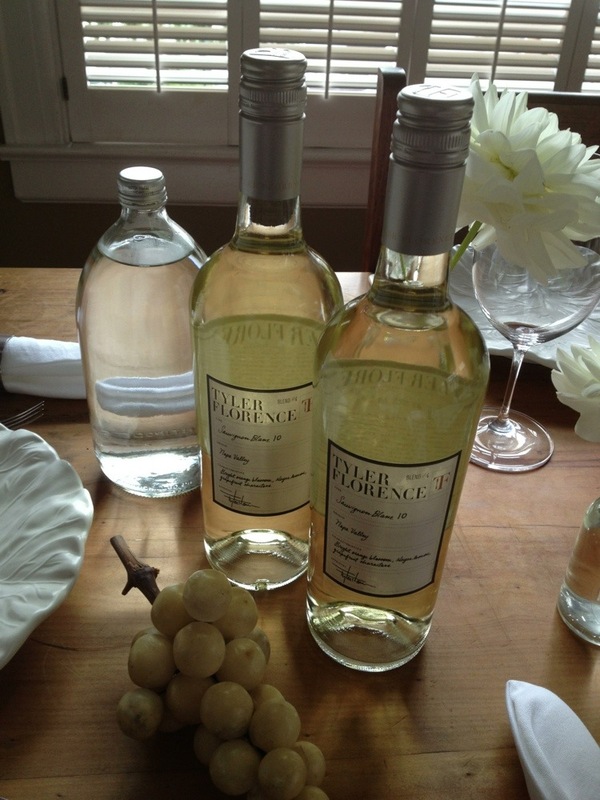 On these hot Summery nights, this Sauvignon Blanc is just the ticket, with a meal or to just savor by the glass. When we are away for a bit of time, one of the best parts of coming back is I know there will be new things that have shown up at the shops while we were gone. 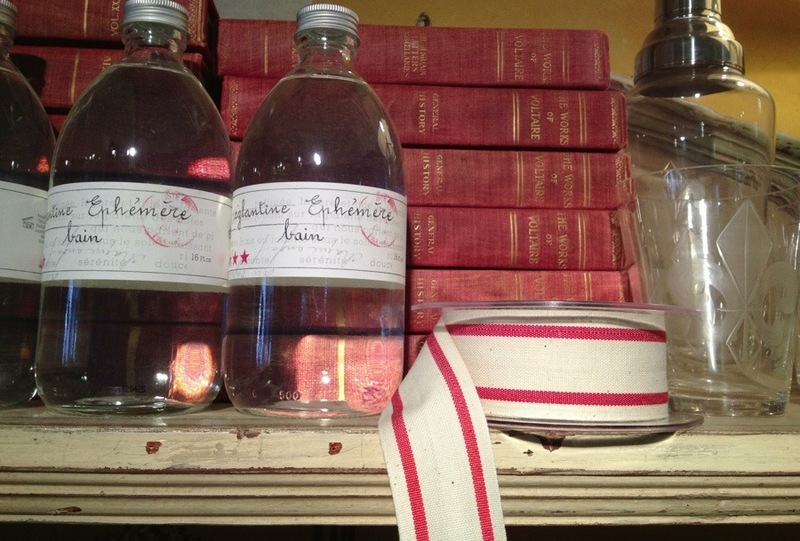 Such is the case yesterday when I spotted this trio looking all swell and swanky on one of the shelves. 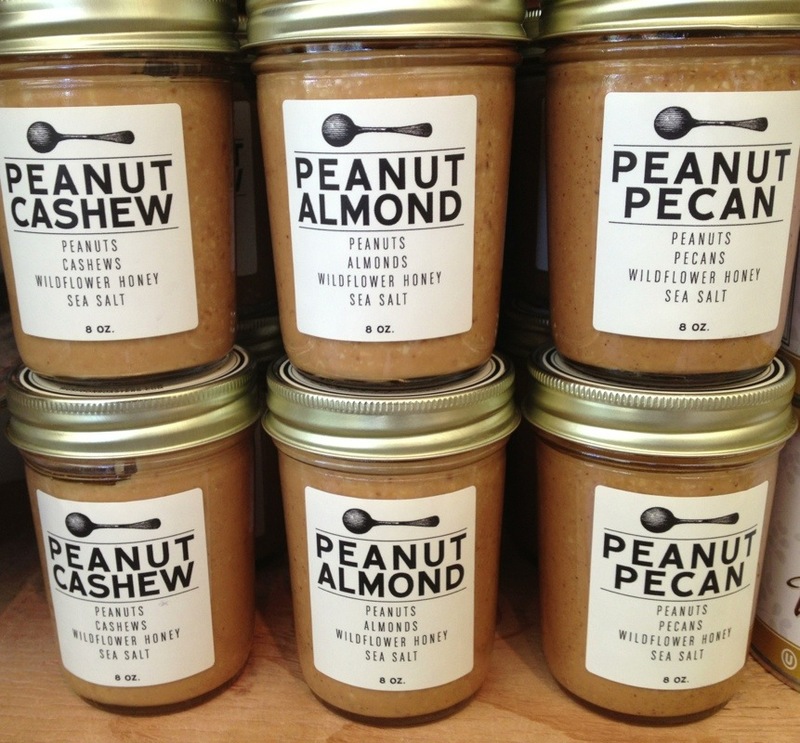 Handcrafted in Durham, North Carolina, these nut butters using cashews, almonds and pecans are divine. Wildflower honey is used in place of palm oil. The honey acts as a natural preservative that prevents staling and spoilage. So there is no need to refrigerate it–so it can go right on to toast without being cold. A big plus. But the biggest plus is the flavor. The addition of either the cashews, almonds or pecans to the peanuts just adds a level of richness and depth of flavor. This is adult peanut butter. From my post yesterday, you can better believe that a hotel silver knife would look pretty darn dandy tied-off of one of these jars. It is a good thing I am a shop keeper, because stuff like this excites me to no end. It just rocks! The gift of jam is such a useful thing to give. Whether spread on toast or mixed with a little Dijon to coat a chicken breast, having various jars or bottles of jam going in your fridge is always a smart thing. If giving that jar of jam also involves a lovely piece of hotel silver tied off of it, all the better. 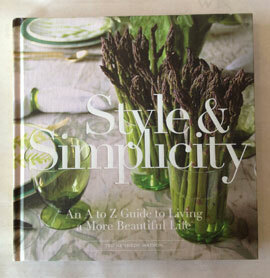 I think it is a nice combo to give a gift of food with something that can be used later on and be long remembered. 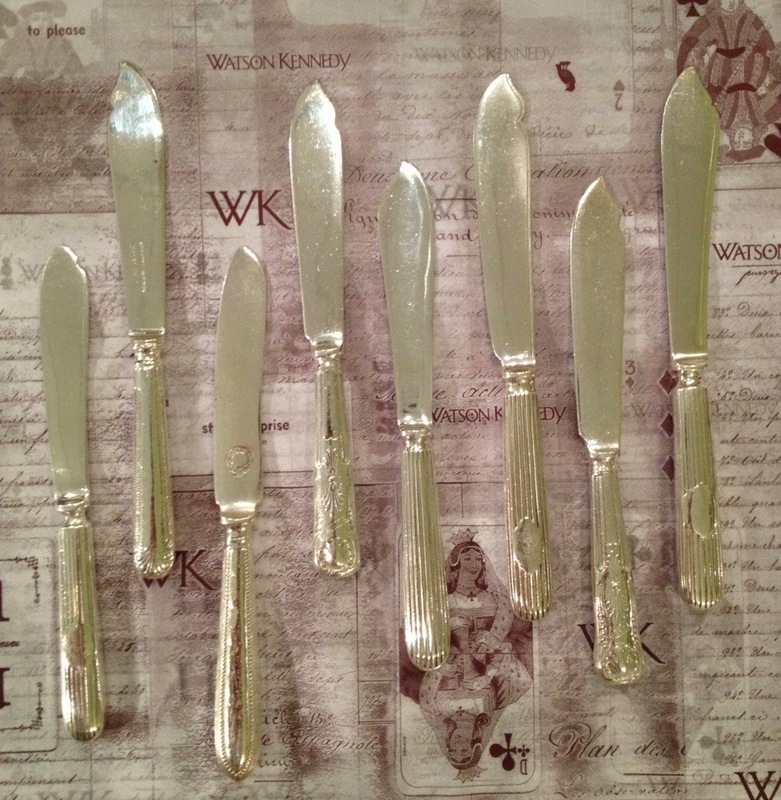 We have been combining these stellar hotel silver spoons and knives with jam for memorable gifts this Summer season–simple, stylish, useful.